Wortley Hall is a beautiful 18th century manor house situated within 28 acres of grounds in the village of Wortley. Wortley is just a mile or so from the A616 (Stocksbridge By Pass) and is close to both Sheffield and Barnsley. It has 49 bedrooms (all en suite) and absolutely gorgeous grounds! This wedding was a personal favourite for me, I met with the bride several times in the year or so before the wedding and seeing everything come together on the day was an absolute delight! 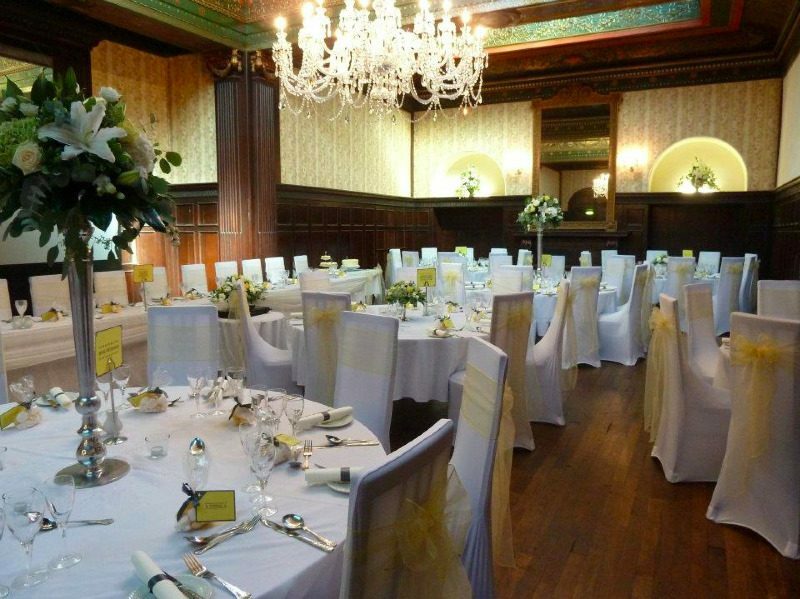 The main function room at Wortley Hall is a beautiful, large room with some gorgeous features. 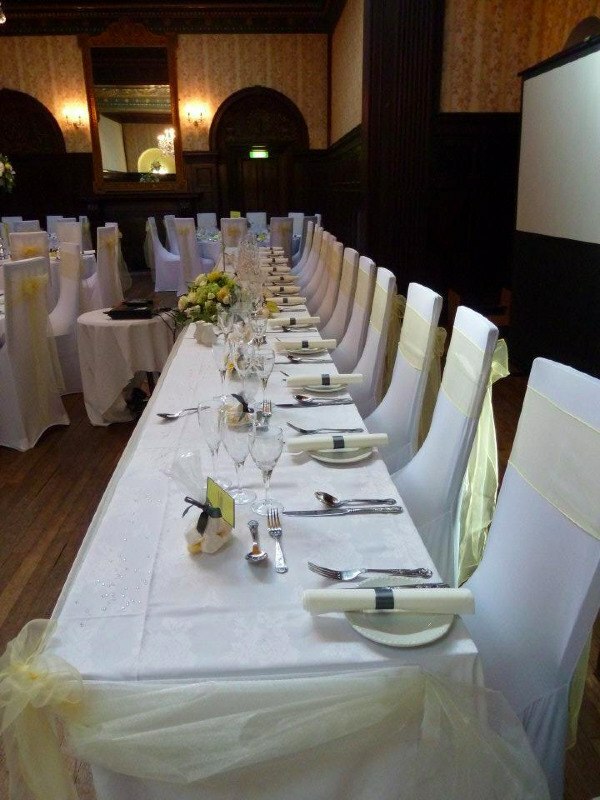 The chairs are very tall with thin, high backs - the only covers which will fit these chairs are our stretch chair covers. The wood pannelling in the room could look quite dark, but with the beautiful light colours chosen by our bride the room looked bright, romantic and very elegant. The 'before' and 'after' photographs show what a difference the chair covers make. 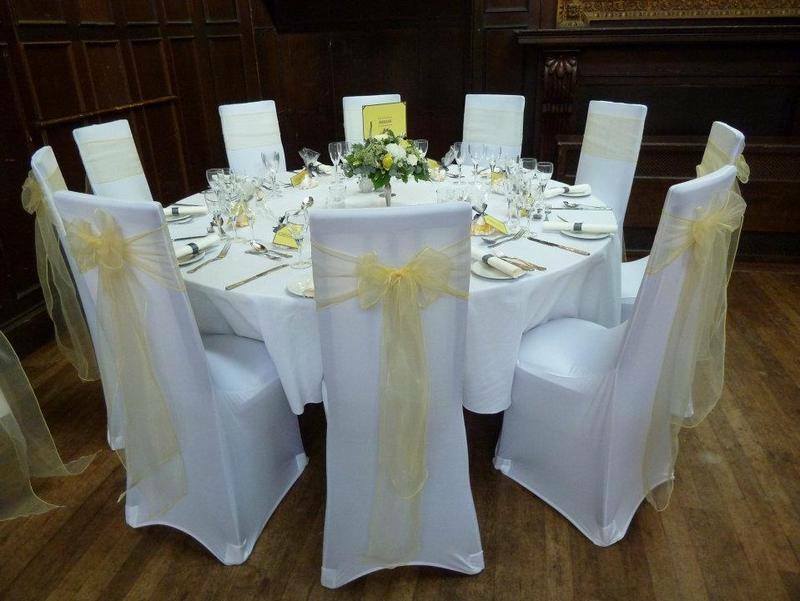 As well as the chair covers, we also provided swagging for both the top table and the cake table in a pale lemon to match the chairs. 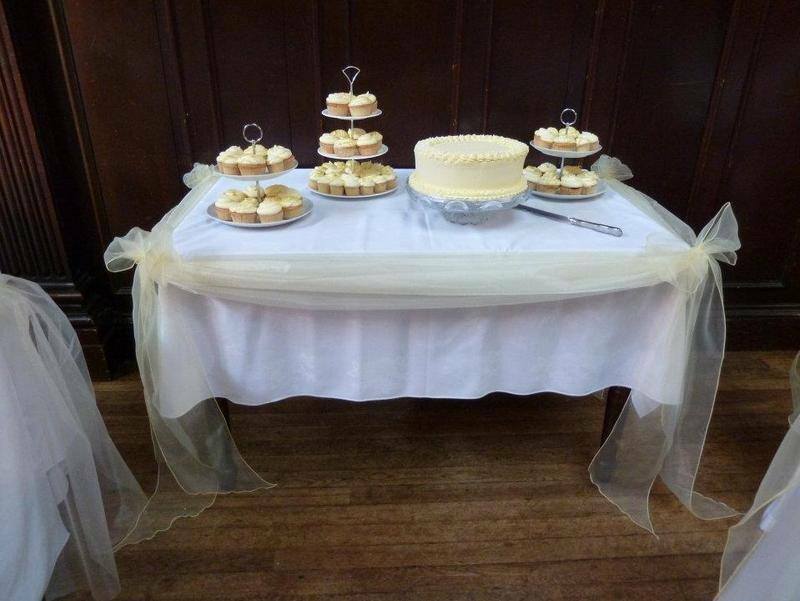 I love the photograph of the cake table! The cakes were by the Sheffield based company 'Fancie' and looked absolutely devine! The flowers on the tables were stunning but unfortunately I don't have the details of the florist. The combination of tall and short centrepieces works perfectly in a room such as this. 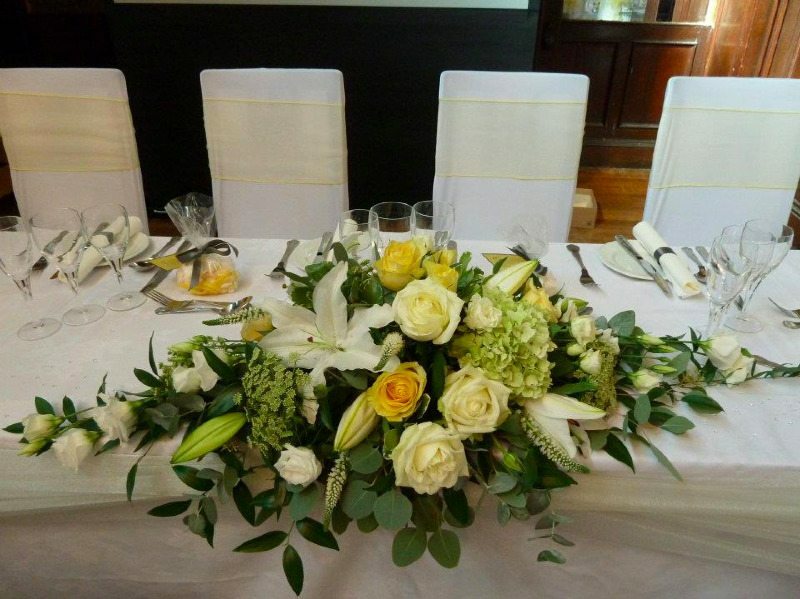 The top table flowers before the traditional 'long and low' style and looked beautiful. A few extra touches were also provided by us for this wedding, including silver grey ribbon napkin bands, scatter crystals, votive candles and the hire of our white metal post box for the gift table. As well as setting all these items out, the bride had also left me a check list of things to double check which included checking name cards and the seating plan, making sure some special gifts and favours were in the correct place, and setting up the guest book and gift table. Finishing touches are so important and I am always happy to help out with making sure that everything is perfect. Kenwood Hall is a four star hotel situated just one mile from Sheffield City Centre. 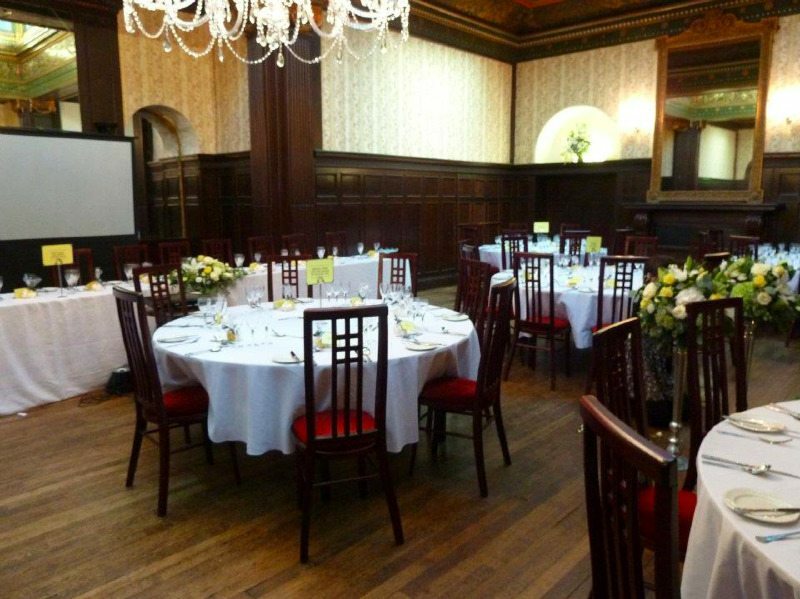 It is a beautiful venue and we found the staff very helpful and friendly. 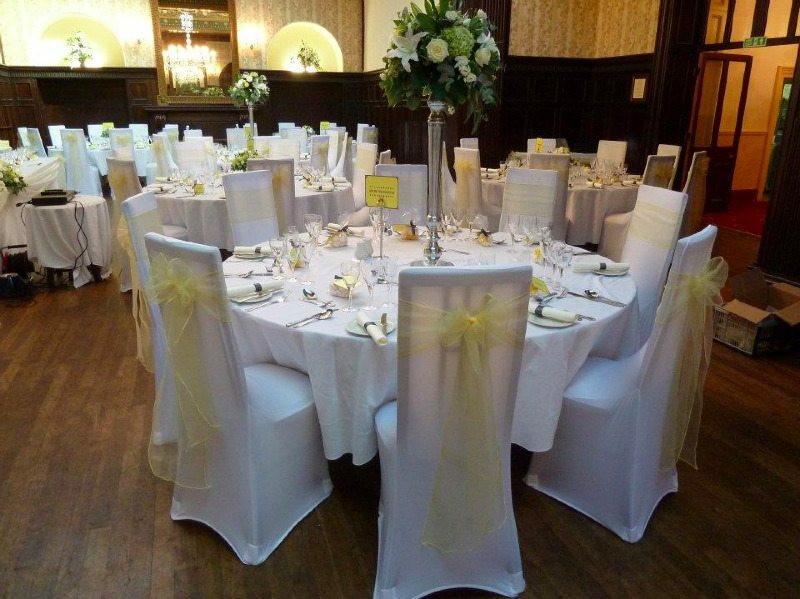 For this wedding we used our white stretch chair covers with dark silver organza bows. The before and after pictures show what a huge difference the covers made. 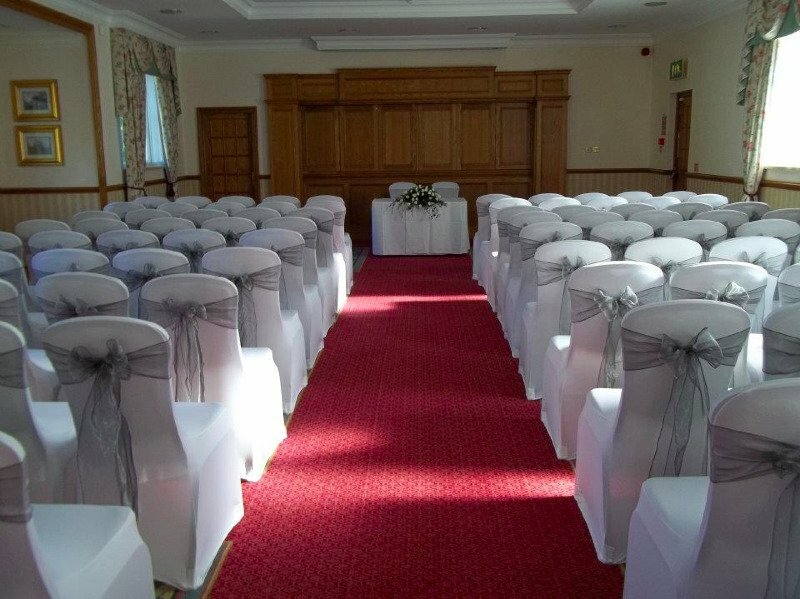 The chair covers in this picture are just £2.25 each including fitting, and I think this is a great example of how that really is money well spent for your wedding. 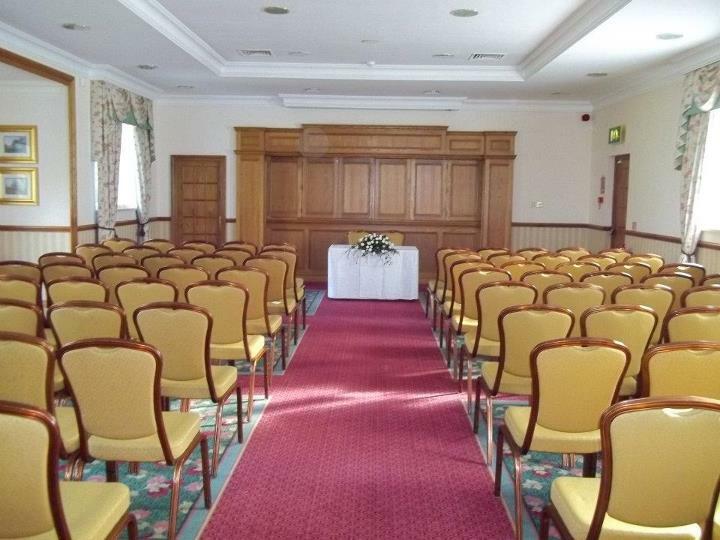 After the civil ceremony the hotel staff moved the chairs into another room for the wedding breakfast and the evening reception. 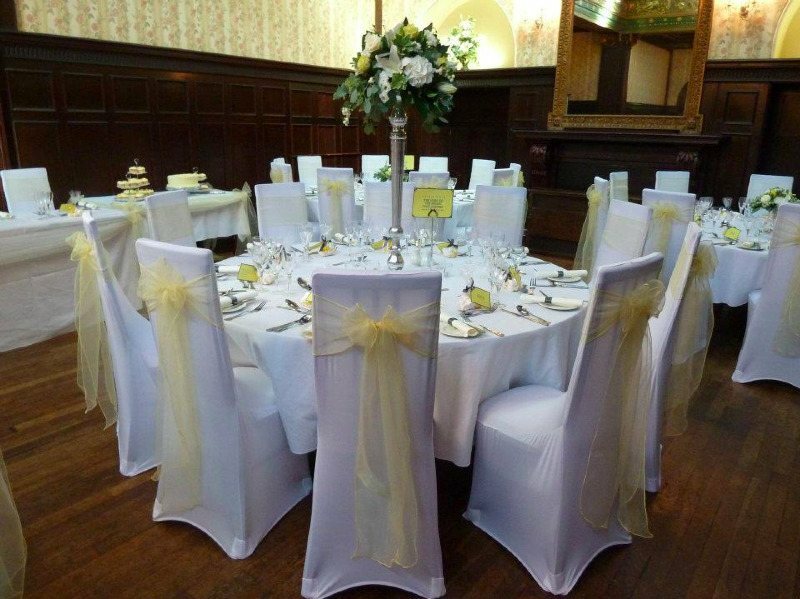 For the price of a wedding favour chair covers really are a must have item.